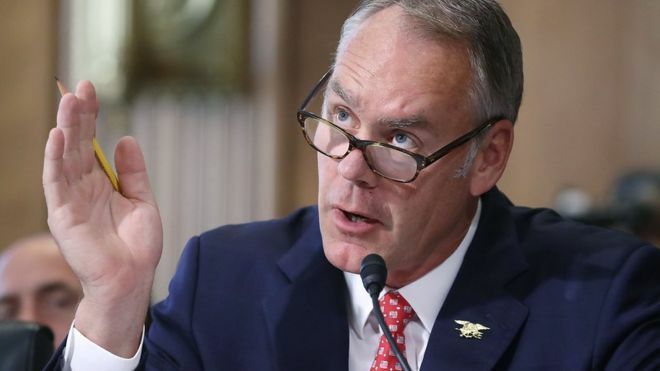 US Interior Secretary Ryan Zinke is leaving his post at the end of the year, President Donald Trump says, in the latest high profile departure from his administration. In a tweet, President Trump thanked Mr Zinke for his service, saying he had "achieved much during his tenure". He said he would appoint a new interior secretary next week. Mr Zinke, an ex-Navy Seal and a former Montana congressman, has been embroiled in allegations of ethics violations. They include a land deal in Montana involving Mr Zinke and the chairman of oilfield services Halliburton, Politico reported. He has faced scrutiny over expensive trips in US Park Police helicopters and on private jets. Costly alterations at his department also came in for criticism, including reports that three sets of double doors in his office were being upgraded at a cost of nearly $139,000 (£110,000). He later said he had negotiated the price down to $75,000. It was not clear if Mr Zinke had resigned or was fired. The interior department oversees federal land, including national parks such as Yosemite and Yellowstone. His appointment angered environmental advocacy groups who accused Mr Zinke of being in hock to corporate polluters. News of Mr Zinke's departure comes just a week after the announcement that Mr Trump's chief of staff, Gen John Kelly, is to leave the White House. On Friday, Mr Trump named his successor, on an acting basis, as Mick Mulvaney, who is currently director of the office of management and budget.